Betting on baseball, basketball and football may prove a massive boost for a New Jersey horse tracks. 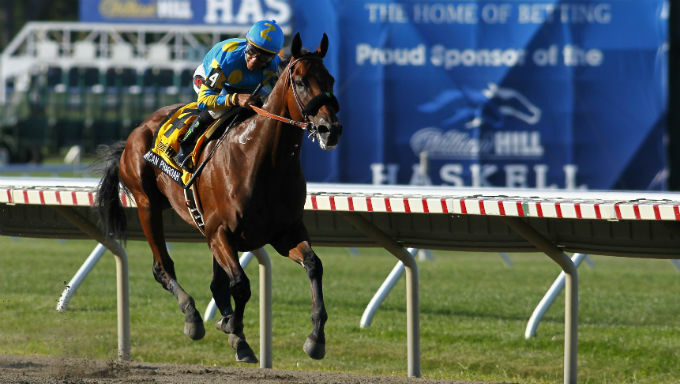 Monmouth Park in Oceanport has been one of the nation’s top thoroughbred racing tracks for nearly 150 years. Capped off by last weekend’s Haskell Day, and the $1 million Haskell Invitational, the track draws thousands annually throughout the summer. But those figures dwindle every fall and winter as races end and the track loses its largest attraction. With legal sports betting, this is set to change. The Asbury Park Press reports the company is already looking forward to record traffic this fall as bettors flock to place bets on Saturdays and Sundays for college and professional football games at one of the few legal sports betting destinations in New Jersey outside Atlantic City. The extra traffic from bettors on football and other sports is expected to boost plans for an extended horse racing slate, said Dennis Drazin, chair of Monmouth Park’s operating organization. "What we want to do is give local horsemen more of an opportunity, which we are going to try to do in terms of a more year-round circuit. So if I bring everyone here in April, which is the intention, begin racing in May and go through Dec. 12 between Monmouth and the Meadowlands, now that gives you a real opportunity here. New sports betting laws have already netted millions for Monmouth Park. As New Jersey challenged a federal ban on sports betting in the courts, Monmouth Park began preparations to take bets on single-game sporting events. The track partnered with William Hill, a venerable sports wagering company in Europe and the leading sportsbook proprietor in Nevada, for a sportsbook. When the Supreme Court struck down the ban in May of this year, and New Jersey officials worked out final regulations in June, Monmouth Park was ready to be one of the first facilities outside Nevada to take a legal sports bet. Three New Jersey gaming sites combined to take in $16.4 million on sports bets within the first few weeks of legalized sports gambling, of which several million dollars in bets were placed at Monmouth Park. With up to 10 more New Jersey casinos and tracks considering sportsbooks, and football season returning next month, this figure is expected to pick up dramatically. The proliferation of casinos, lotteries and other gaming options in most U.S. states along with changing generational tastes have slowed attendance and revenue streams across the nation’s horse tracks. Illinois, the nation’s sixth-most populated state, has seen two of its five tracks close in recent years and revenue has fallen to half of where it was 10 years ago. To stem the losses, tracks have converted themselves into “racinos”, which feature casino-style table and slot games at the same facility as existing horse tracks. Some states, like Illinois and Virginia, have looked to historical horse racing game machines as an alternate revenue solution. As New Jersey has shown, sports betting is another viable option. Only eight states have passed sports betting legalization laws and only six are on pace to take bets this year. A chance to become an early adaptor of sports wagering could prove a significant jump start for the horse racing industry.